﻿Here’s the thing about celebrating the holidays in Texas: the weather is not worried about you and will act up accordingly. I’ve lived through so many 70º and up Christmases that tbh, I’ve lost count. 🤷🏾‍♀️ While a White Christmas isn’t exactly something to expect when you live in the South, there’s plenty of time to slip on something a lil light.😏 This dress from Booohoo is the perfect addition to your closet if you want a break from pants when the cold front breaks. Before I get any further ahead of myself, I have some BIG MAJOR GRANDE news to share. I’m officially an Influencer with rewardStyle!🎉 If you’re a lil confused by what that means, lemme help you out. From now on, you’ll be able to shop my looks even easier with the LIKEtoKnowIT app! That’s right, I’m one of those gyals with the lil screenshot icon in the pic now! Follow Me on the app to shop🛍 my look with your screenshots instantly! If you’re not an app person, no worries! My blog posts will continue to link directly to all my looks and suggested picks so you don’t have to switch up on ‘em if you don’t want to. Fun Fact: I wasn’t wearing a lick of lotion but my photographer Kierra held it down with the edits to make me look moisturized af! 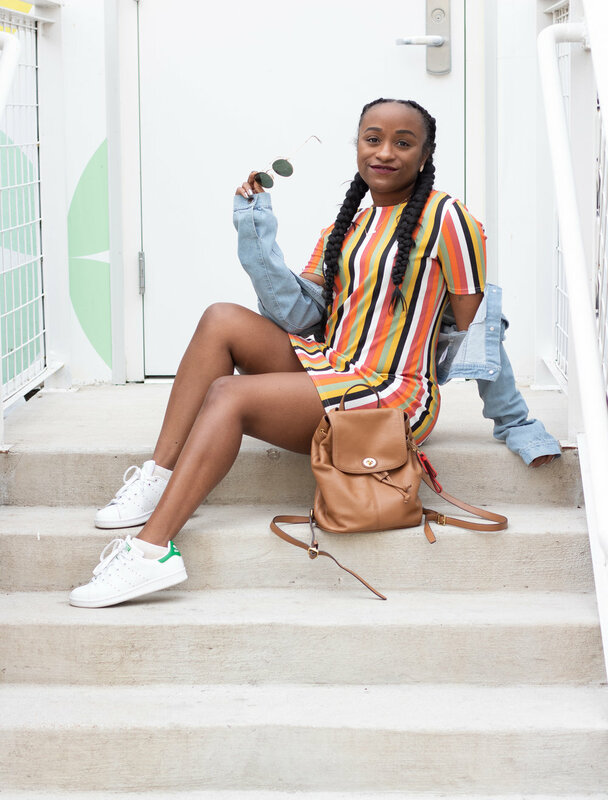 While you plot on how you’ll style this multicolor cutie, I’ve got some pro-tips to share with you whenever you’re stuntin’ in some stripes. 1. Horizontal ain’t hot.🙅🏾‍♀️ I’m gonna skip the long talk and come right out with it–– horizontal stripes ain’t it chief. Whenever you wear stripes, opt for vertical ones for several reasons. Vertical stripes elongate your figure and also have a slimming effect to the eye. To avoid looking wider than you are, skip the sideways stripes. 2. Accessorize Wisely.🧠 This one goes without saying, but you never want to be caught slipping looking too busy with clashing accompaniments to your look. When wearing something v bold, try pairing with more monotoned or minimal accessories. 3. Stunt Shamelessly. 🌈At the very core of the pattern, stripes are a way to disrupt our eyes from what they would normally look at and gloss over. When you slip on something stripey, don’t be afraid to rock it like Rihanna would. Which means, f*ck it up, sis! You know I wouldn’t leave you hanging without sharing a few of my favorite striped out things. Peep some of my picks below and get to shopping! Alright, y’all! I’ll be back quick, quick for some lewks you need to sleigh the holidays the Paige way. Stay tuned and happy shopping!